And these gumball cookies make me smile:) The colors are so bright and cheerful! The inspiration for the gumball machines came from the one and only, Sugarbelle (Callye), and the cute little gumball idea came from the amazing Partiologist (Kim)! I just love my versatile, little, round cookie cutter! Thanks so much, Callye and Kim! The gumball machines were made using a template that I cut out on heavy paper. The cookies were iced with royal icing, and m&m candies (gumballs) were added while the icing was still wet. Also, I don't know if you can tell, but I used some silver luster dust (mixed with clear vanilla extract and applied with a small paint brush) for the "metal" details on the gumball machine after the royal icing was dry. Lastly, an AmeriColor Gourmet Writer was used for the black detail. I packaged each gumball machine cookie in a clear, cellophane bag, and tied it with a ribbon. I included some gumball cookies in each bag and gave them as gifts. Bubble Gum Alley is a local tourist landmark in downtown San Luis Obispo, known for its accumulation of used bubble gum on the walls of an alley. It is a 15-foot (4.6 m) high and 70-foot (21 m) long alley lined with chewed gum left by passers-by. The locally created, "most-talked-about landmark" covers a stretch of 20 meters between 733 and 734 Higuera Street in downtown San Luis Obispo. The consensus is a toss-up as to whether this collective gum wall is an eyesore or a work of art. What do you think? Would you like to chew a wad of gum and add your own masterpiece? Looks like this was a unique way of asking someone to the prom:) (I accidentally cut off part of the question mark when I took the photo.) I wonder what the answer was?!? If you're ever in the area, be sure to take a stroll down Bubble Gum Alley, and don't forget your gum! Of all the times I've been to SLO and walked down this alley, I have never once left my gum. Things need to change. However, what a cute idea for a kids party and I know my grands would love them. I'm with Susan. Your cookies are just so perfect! Not sure about Bubble Gum Alley there. But I bet my kids and your Munchins would love it! Sue, your cookies are absolutely adorable!!! We were just up in Seattle and I wanted to go to Gumball Alley but it was rainy and gross outside. We'll have to go back! It's totally gross and totally cool all at the same time! I grew up in Cali and when I was a senior in high school my bff was a freshman at Cal Poly. I spent many a weekend in SLO and have left my own gum in bubble gum alley. I love your cookies! You did a great job with your gumball machine template and though hand-cutting takes more time and effort, it was certainly worth it. These are really cute. I love the cookies and the use of m&ms especially. I've been to Bubble Gum Alley years ago - looks like it's expanded a great deal. At least that's how I remember it. The cookies are so cute! And bubble gum alley is ... intriguing. I must admit I'd be a little turned off by walking through other peoples' used gum, but it does look pretty. But your cookies are just gorgeous! These are super cute! I must go to that alley sometime. My daughter would LOVE it! Your cookies are so much fun! The bright colors are just perfect, I love how you get such true coloring with your frosting. My first thought with the gum alley...does it smell like bubble gum??? Mara, I really didn't notice it smelling like bubble gum, so I guess not. BTW, I use AmeriColor soft gel paste food color. I love the "super red". Oh my goodness! These are like the cutest cookies ever! what a such lovely post, your blog is amazing.The cookies are the cutest thing that saw. Beautiful !!! I do love the little gumballs--they are so dang cute. Good job. Gorgeous cookies! I can just see a bubble gum themed kids' party! Keeping this in mind for my kiddos birthdays! OOOOHHHH I just LOVE these!!! The gum ball machines are DARLING!!!! Such a fun cookie to give as gifts!!! We have been saying prayers for your son at our house.....how is he doing? Hope he is well!! Art comes in all forms! I am going to take your form. How funny that they have gotten so creative with it. Always a big fan of your creativity. You must be one of the best art students when you were at school. 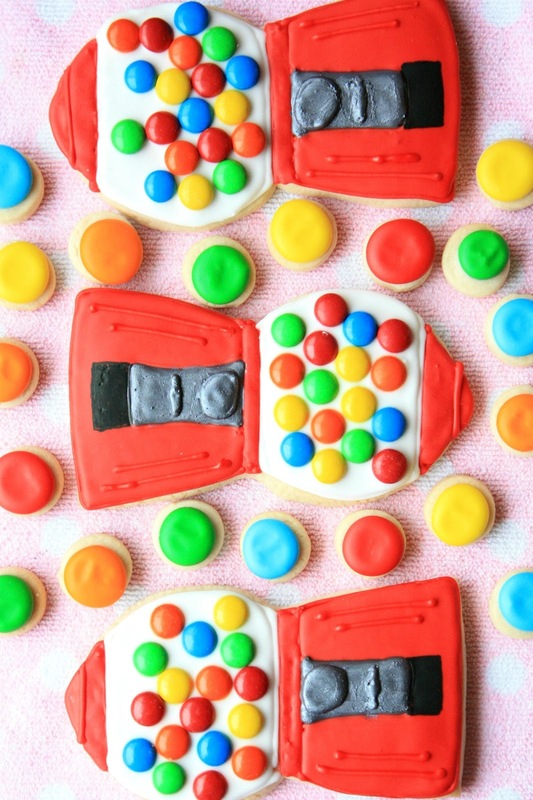 Your gum ball cookies are popping with lots of colours and fun! I love how you used Bubblegum Alley as an inspiration for these beautiful and creative cookies! It's amazing how an alley of ABC (already been chewed) gum can be transformed into a work of art. It's gorgeous (although I'd never touch lol). The prom invite is definitely unique - I wonder if a marriage proposal will show up one day? I hope all is well with you..and your son is doing better xoxo. Wow these are great! I honestly didn't remember how as a child I loved gumball machines until I saw this cookie. Had a flashback and recalled how I thought they were so pretty with all the colors of gumballs inside and the fun of not knowing which you would get. Thanks for sharing your adorable cookies and bringing back fun memories!